8:40 AM - 9:40 AM: Workshop: Cultural Awareness: Recognizing traditions, values, language and greetings for employees of diverse ethnicity, religions, genders and disabilities. Presented by YES Institute. This session includes an exercise on non-judgmental response. 9:40 AM - 10:40 AM: Workshop: Navigating Workplace Discussions: Recommendations for dispute resolution. Presented by YES Institute. This session will include the opportunity for attendees to engage in communication exercises. 10:50 AM - 11:50 AM: Panel Discussion: How to Successfully Interview and Hire Diverse and Successful Employees. Panelists include the CEO of Imperial Point Medical Center; Senior Diversity & Inclusion Relationship Manager of TD Bank and the Assistant Director, Distribution Performance at Northwestern Mutual. You're invited and encouraged to join us for an informative day of learning. 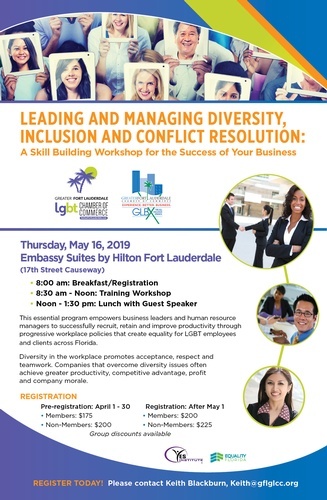 This essential program empowers business leaders and human resource managers to successfully recruit, retain and improve productivity through progressive workplace policies that create equality for LGBT+ employees and clients across Florida. Diversity in the workplace promotes acceptance, respect and teamwork. Companies that overcome diversity issues often achieve greater productivity, competitive advantage, profit and company morale. 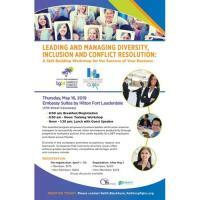 This event is a joint presentation by the GFLGLCC & GLBX. Sponsorships are available.